BLOX Fuel Pressure Regulator - Dezod Motorsports Inc - Home of the automotive performance enthusiast since 2002. The BLOX Racing Adjustable FPR is an affordable and easy-to-install alternative to those complicated and expensive aftermarket units. This billet aluminum piece installs onto the factory fuel pressure regulator, turning it into an adjustable unit, allowing users to properly tune the air / fuel ratio. This is ideal for any aftermarket products requiring a bump in fuel pressure. It is designed to work with the factory or an aftermarket fuel rail. The BLOX Racing Competition 2-Port adjustable FPRs are designed to offer high performance and reliability. Each FPR unit comes pre-assembled from BLOX and is guaranteed to offer consistency each time the engine is turned on. 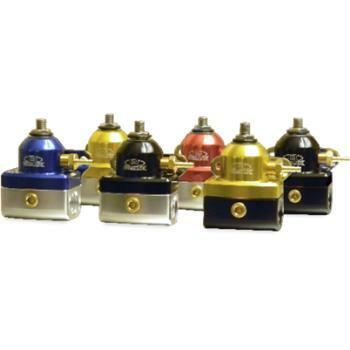 These billet aluminum units feature -6AN inlet and return ports in-line which offers more flexibility during installation, 1/8” NPT ports, are compatible with gasoline, diesel, methanol and ethanol. These billet aluminum units feature in-line -6AN inlet and return ports, -6AN return port on the bottom and 1/8” NPT ports. The BLOX 3-Port FPRs are also compatible with gasoline, diesel, methanol and ethanol.